Tudungan is a Javanese slang word meaning shade. Based in Jakarta Indonesia, we are a not-for-profit organisation that creates sustainable urban shade solutions for Indonesia’s harsh hot climate from waste products. Tudungan works to give new life to waste materials which would otherwise end up on the streets and in our waterways. Currently there is a huge problem with the disposal of waste in Indonesia. Companies use cheap petrochemical based plastic packaging in their products and advertise on plastic banners and billboards. Much of this waste is tossed on the street as there is very little protocol for the collection of waste, polluting the waterways and larger bodies of water that they flow into. Once this happens the rubbish breaks into unusable pieces which can take many generations to decompose. William Harris states in his article for ‘Science, How Stuff Works’ that petrochemical plastics “in warm water can degrade in as little as a year” which is much quicker than plastics in landfill however as the plastic degrades in the water it emits toxic chemicals that end up in the stomachs of marine animals and washed up on shores. Tudungan aims to break the current life cycle of waste in Indonesia by taking the plastic waste off the streets before it reaches the waterways and is unable to be reused. We propose to do this by using Indonesia’s ‘trash pickers’ to sort through the waste for us and collect useable pieces of plastic that we are able to buy from them. Medina writes for United Nations University stating that “Scavenging is an important economic activity that provides income to over 15 million people worldwide… one percent of the urban population in developing countries makes a living from scavenging”. Through purchasing plastic from these people we provide an extra source of income for those who depend on sorting through rubbish in order to feed their families. 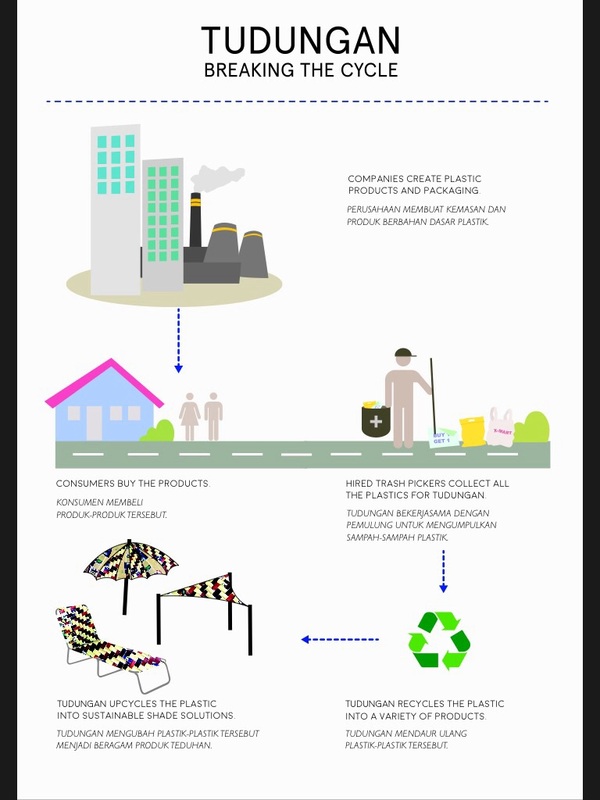 We use this plastic waste to create a variety of different shade solutions for different demographics. 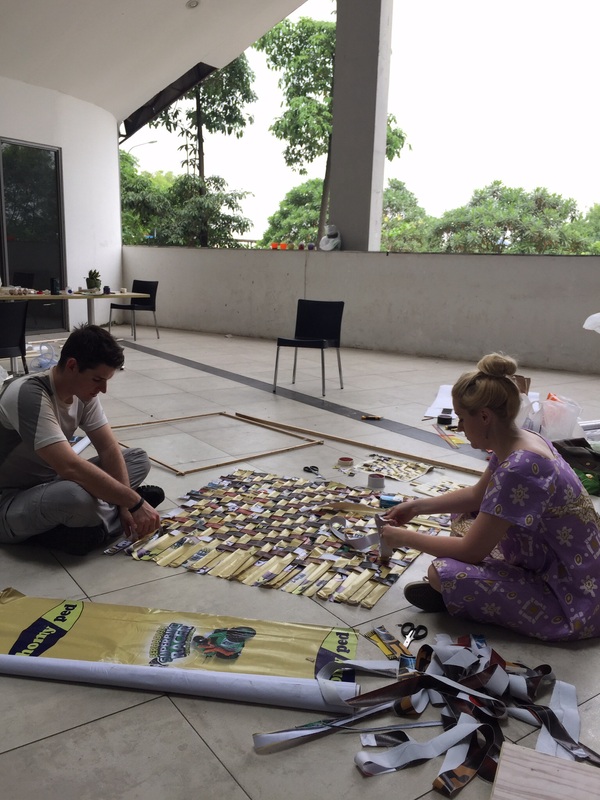 Our ‘Warung’ shade solution shown here today is made from used advertising banners. These banners have been printed on low quality plastic sheeting that tears quite easily – due to their single use production quality. 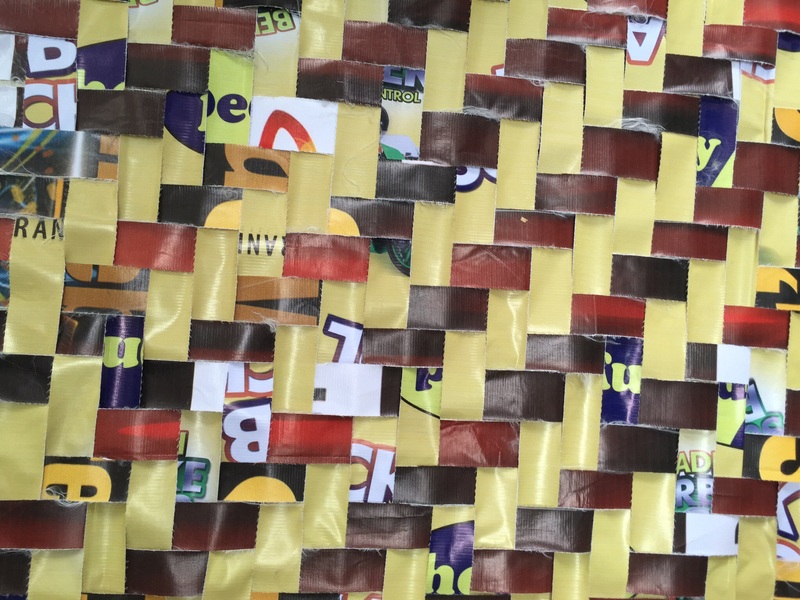 By tearing the plastic sheeting along the grain and weaving these pieces together we have greatly increased the strength of the material and have stopped it from further tearing. Another of our shade solutions is the re-purposed Nipah weaving technique, used in many South-East Asian countries. This technique traditionally uses leaves from the nipah palm utilising the abundance of waste in urban environments and lack of traditional materials. The money generated from the sales of commercial umbrellas products provide us with the opportunity to educate local communities on integrating waste materials with traditional techniques, such as the nipah leaf waste substitute. 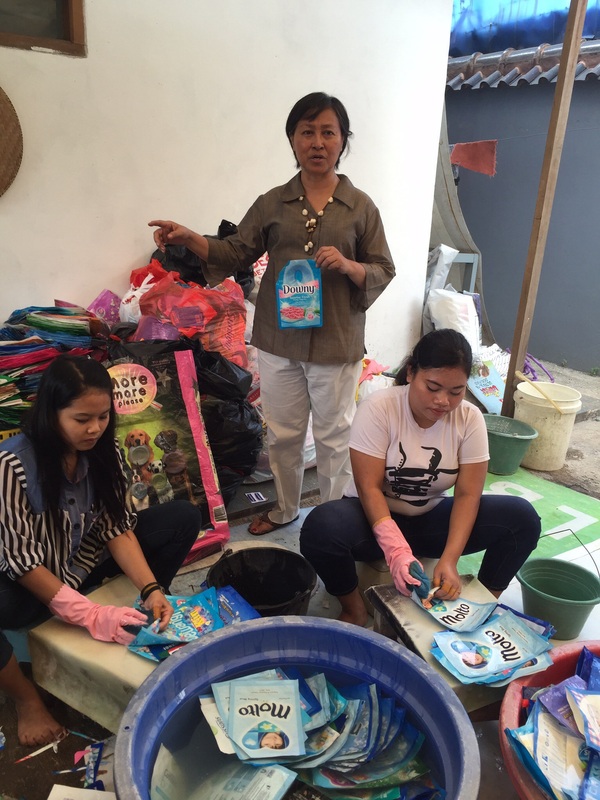 Upon visiting XS Project, Managing director Retno Hapsari (Hapsari with XS Project, 2015) explained their upcycling program used donated banners that were made from tough German plastic however, recently companies have been purchasing cheaper banner materials as they are more cost effective. Re-using this waste material has become problematic for XS project, as their products are typically bags that need to be able to withstand holding a certain amount of weight. Retno spoke about the aim of the initiative saying, “the idea is to extend the life of the trash, it’s all about the awareness” This message is intriguing and appealing – educating consumers while also sheltering them from the harsh Equatorial climate. 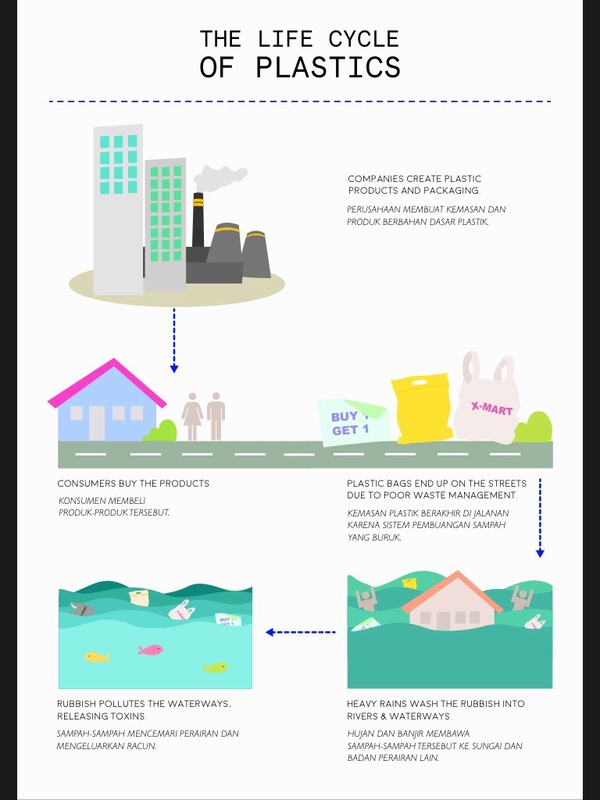 Tudungan creates products which effectively educate and prevent plastic waste entering waterways by moving the waste to a more sustainable path and extending its end-use. We are a collaborative organisation working hard to change the damaging way we consume and dispose of products and we encourage you to use our methods of up cycling within your own lives. With your cooperation and support we can change the fate of our aquatic bio systems and build a more responsible relationship with the waste we create. 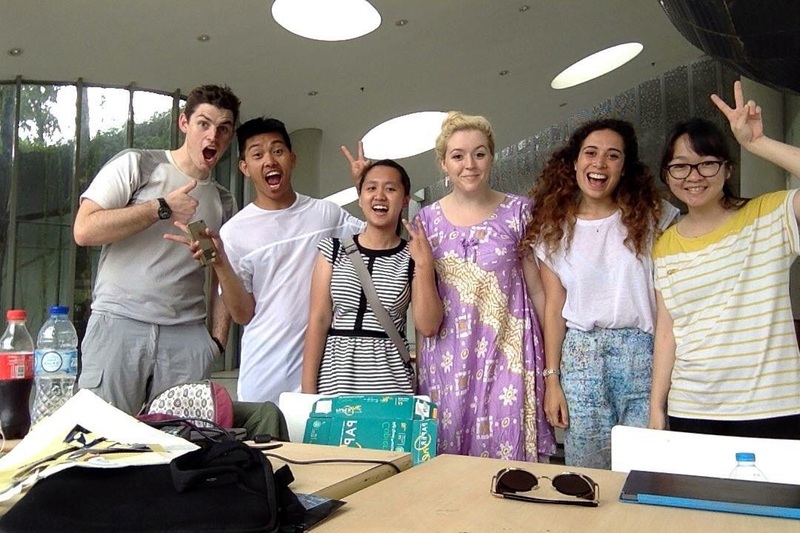 Bradley Saywell, Christian Rodriguez, Fransisca Nadya Atmadja, Bernadette Keil, Talia Jimenez & Olivia Chandra. I interviewed Indonesian born but Sydney based Cassandra Wilmot. ‘Cass’ as she likes to go by lived in Indonesia until the age of 14 with her grandmother before moving to Sydney. She can speak fluent Indonesian and is also majoring in Indonesian language at the University of NSW. The most interesting thing that Cass mentioned is that Indonesia is a melting pot of different cultures – having been colonised by the Dutch, Malay, Chinese peoples, their society is a multicultural and diverse. She advised on visiting Indonesia to leave the major cities behind and travel in the rural areas around Java & Sumutra as these areas are hot spots for tradition and culture. She recommmended visiting is Bukkittinggi in West Sumatra. Located in the Highlands of Sumatra the area is surrounded by beautiful landscapes and 2 Volcanoes. More importantly the area is probably the most diverse area in Indonesia as it has served as major city during both the Dutch & Japanese occupations. When talking about our trip to Indonesia in July she said that Indonesia during Ramadan is one of the best times to go. During Ramadan people are more friendly and there are many more activities held. She especially said the food is awesome when everyone comes together when the sun goes down for food – it was interesting to hear she sees her family more during the month of Ramadan than at any time of year because during Ramadan they make a point of always eating together. She said in Indonesia there is alot more pressure for girls to wear the Hijab as well – more for protection. Cass actually wore the Hijab during her time in Indonesia but chose to not wear it in Australia as there wasn’t really a need for it – she described the sensation of being ‘free’ once the Hijab came off, she also really wanted to show off her beautiful hair. She also told me that she is really interested in studying Indonesia’s history especially the years in which Suharto was in power. She said that many Indonesians disappeared over the years and that at that time Indonesia was a horrible place to be. After our interview we actually went to 4A Gallery and viewed some works by FX Harsono which was a commentary on the Suharto era and the mass executions. After our talk It was really interesting to see how many lives were affected by Suharto as Harsono’s father was actually one of many who disappeared during the period. 4A Contemporary Art Gallery constantly includes Indonesian Visual Artists in the Exhibitions. The exhibition currently on show “Tell me my truth” is a show that looks at the relationships of an individual within a group. One of the Artists is well renowned Indonesian Artist FX Harsono. Harsono is one of Indonesia’s most prolific and provocative artists to come out of Indonesia’s contemporary Art Scene. Harsono is a perfect example of an Indonesian artist – a figure constantly criticising and questioning Indonesian Politics, society and Culture, he is one of a few artists that lived through massive upheaval and social unrest during Suharto’s reign. His work constantly revolves around the interaction between Chinese minorities within Indonesia to the mostly Malay population. FX Harsono is a multi-disciplinary artist working from Video Art to 3d Installation and sculptures. His work in the 4a exhibition titles “Pilgrimage to History (2013) once again explores the politically charged era of Indonesian history through a process of contemplation at Mass grave sites around Indonesia. We see through his work his search for identity in the culturally diverse and rich melting point that is Indonesia. Another show exhibited at 4A Gallery was ‘Survivor’ by Dadang Christanto. Australian-Indonesian artst Christanto’s work is exploration of the disaster and it’s human impact on events in the Sidoarjo region of East Java where hot volcano wiped out 11 nearby villages. Christanto’s work displays the rich land that Indonesia occupies in Asia. His work perfectly captures the group mentality of the Indonesian art scene, where in the work ‘Survivor’ volunteers silently occupy the space, covered in mud and holding a photographic portrait. The work also has a political aspect, continuing his enquiry in response to his father’s disappearance under the Suharto regime in the mid 1960’s. Both these artists embody the ‘Indonesian artist’, an artist that is multi-disciplinary who is politically engaged who constantly gives back to the local Indonesian community. In many third world countries many people do not have access to clean drinkable water due to pollution, waste management and a myriad of other issues. There have been many projects around the world whose aim is to regenerate their water supplies. One such project that was launched in the Philippines in 2009 was the “Kapit Bisag para sa Ilog Pasig” (Linking arms for the Pasig River). The river in itself is the main river running through Manila and many of the poorer citizens depend on the Pasig to live. The project was run by the ABS-CBN foundation and they held many events to fundraise ro revitalise the polluted river. Even though in the Philippines they were able to successfully complete the project there are still many areas. 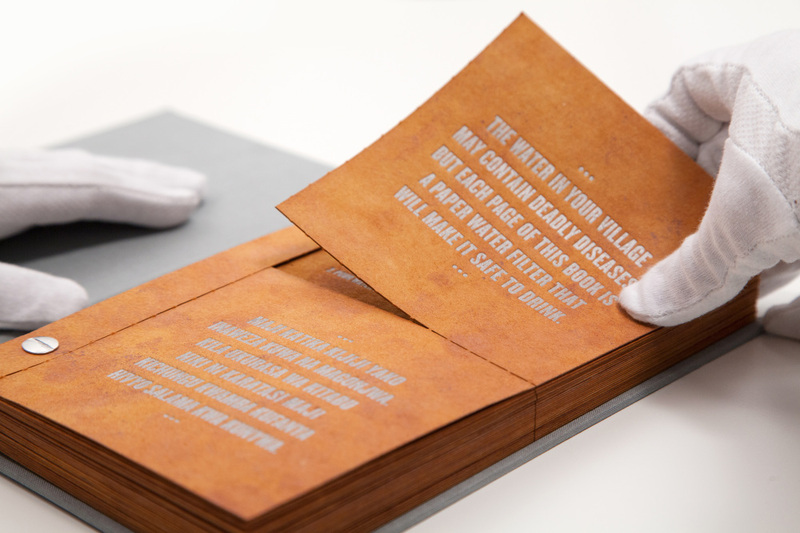 This idea of providing clean drinking water for the less advantaged was tackled by a multi-disciplinary team of Scientists and Designers (Theresa Dankovich, WATERisLIFE and marketing firm DDB) who came up with the idea of “The Drinkable Book “. On first inspection the ‘Drinkable book’ looks like any other Hard Bound book. Scientist Theresa Dankovich invented a bactericidal silver nanoparticle paper, pAge, for PHD. As part of the Global health in Limpopo project she travelled to South Africa to test her pAge papers. Each page is about a millimeter thick and contains the silver nanoparticles, the silver can rid the water of harmful microbes, but with little to no effect on humans. 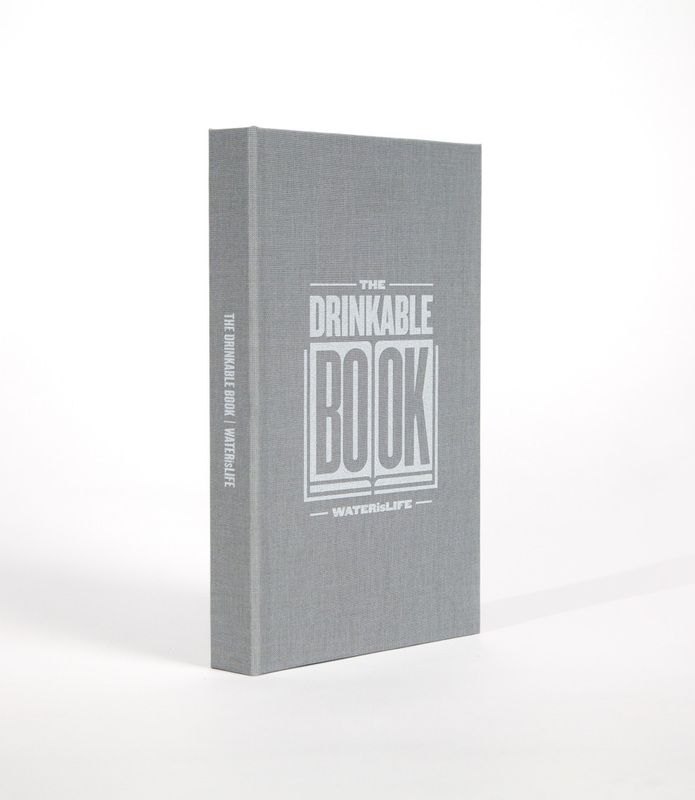 In collaboration with Designer Brian Gartside & DDB Worldwide they designed a beautiful book whose pages filter dirty water of any deadly diseases. Once water is passed through the filter, bacteria count is reduced by over 99.99% per cent. The paper costs only pennies to produce, making it by far the cheapest option on the market. Each filter is capable of giving someone up to 30 days worth of clean water. 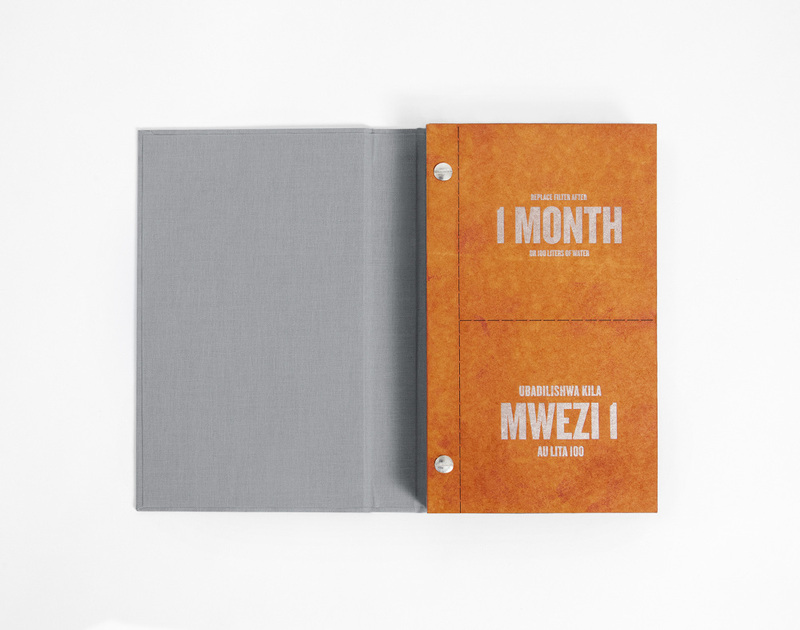 And each book is capable of providing someone with clean water for up to 4 years. 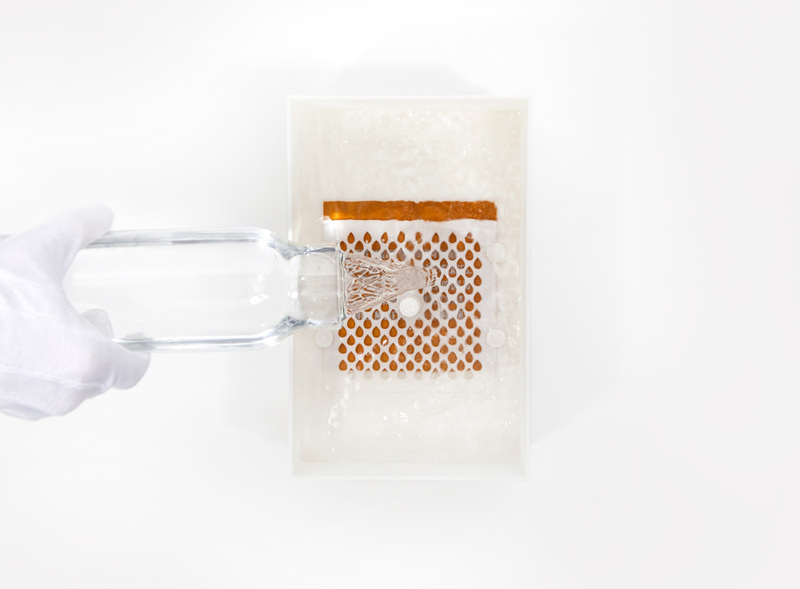 To use the book, you rip one of the pages in half, slide it into the filter box (which doubles as a cover for the book) and pour contaminated water through. The water safety tips, printed in nontoxic ink, include washing your hands before eating and keeping trash away from your water source. That information will be printed in English and local languages. With a cost of 10cents per filter paper each book can last up to almost a year.